Home > Mascara > 5 Budget Mascaras to Try !! 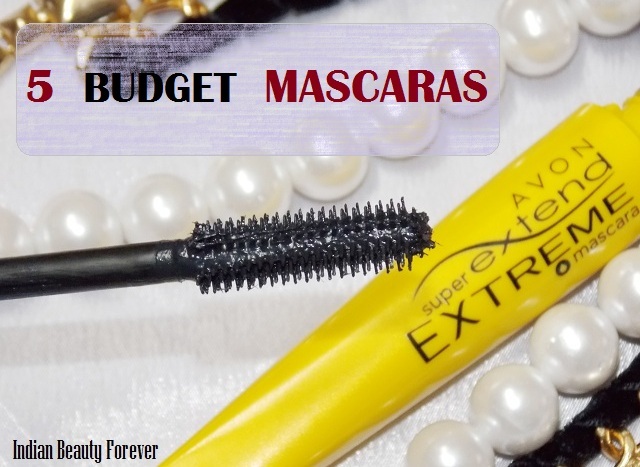 5 Budget Mascaras to Try !! I just love mascaras!! Eye makeup can’t be completed without at least going for a coat of mascara. Right? Even if you’ve skipped eyeliner or kohl, mascara alone can do wonders and gives you those fluttery eyelashes for an illusion of bigger and wider eyes. In this post, I’ll share some of the worth trying and in budget mascaras, Also considering the fact that amongst most of the makeup products mascaras has a very low shelf life, which means you're supposed to change your mascara after every three months as they get dry soon or can be contaminated easily thus in anyways, it becomes important to change them frequently, which is why inexpensive mascaras are there for you. This is by far my absolute favorite. If you remember, I have done a review on this, I mentioned that it has got tiny fine fibers that stick to the lashes for a longer looking lashes. What makes it stand apart is, its brush which combs the lashes beautifully so that there is minimal clumping and they look longer. It costs rupees 449 and totally worth it. Maybelline mascaras have been undoubtedly hot favorites not only because they can give you those thicker and voluminous lashes but the price that they come at, makes them worth trying and good to include mascara in your vanity. It costs only 200 bucks. When Rimmel Cosmetics were launched here last yesr, I was quite surprised by their prices. Rimmel Extra Super Lash Curved Brush Mascara, again is one of those mascaras that has a curved wand. So, while you’re trying to put the product on your lashes, it also curls them gently, though it will not give you extremely thick lashes like the one from Maybelline that we just spoke about but nevertheless for daily use, at 200 bucks, it can be tried. Apart from that Rimmel has got loads of mascaras under 500 rupees, if you would like to switch on to a new one. Think of them! Just like the Colossal kajal, Colossal mascara is equally popular. The yellow tube that it comes in, surely looks enticing and the wand with a straight but thick brush makes sure that you get voluminous lashes with lesser clumping. This too comes in two variants and at 330 bucks. Lakme Eyeconic kajal and mascara were launched at the same time. The curling mascara with a slightly curved wand is just like the Rimmel mascara and gives decent thickness and the length with lesser clumping. Priced at 250 rupees Eyeconic mascara would be good for everyday use. It isn’t that difficult to get rid of as compared with the maybelline ones. So, that was it! which is your favorite or go to mascara, that you've been loving currently?